The first 150 years of United States history – from the initial European settlements to the Civil War – are peppered with thanksgiving celebrations and proclamations, but we tend to associate our American Thanksgiving with the harvest feast celebrated by 50 surviving Mayflower Pilgrims and 90 Native Americans in Plymouth, Massachusetts. 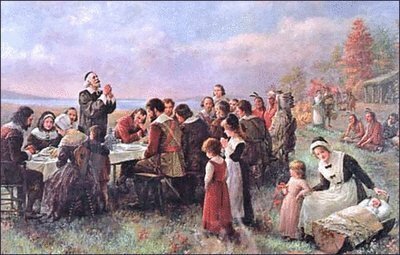 The Pilgrims were grateful for religious liberty, and for the bountiful harvest they’d just taken in (thanks to a great deal of help from their Native American neighbors) after a harrowing sea voyage and a winter of illness and near-starvation that reduced their numbers by half. We, great turkeys of destiny, have become a symbol of food for Thanksgiving. Every year one of us is taken away. Where? To the kitchen table! But we, my glorious turkeys, we will stand this injustice no more! This is an outrage! We must rise up! A…REVOLUTION! Did I mention that this speech was delivered immediately after every single one of my daughters had eaten turkey? But are the rest of us any more consistent than my daughters, lamenting the turkey they’d just eaten? We stage a feast imitating the Pilgrims’ thankfulness for the harvest, when most of us consume far more calories than we need every single day of the year. Is our feasting gratitude, or just more gluttony? Thanksgiving as a national celebration began to take shape around the time of the American Revolution. In 1777, the Continental Congress issued the First National Proclamation of Thanksgiving, thanking God for blessing this infant country. Additional national thanksgivings were proclaimed for various dates between 1782 and 1789, when President George Washington designated the first Thanksgiving Day – a practice that continued under all subsequent presidents (except Thomas Jefferson), until Abraham Lincoln set an annual Thanksgiving holiday for the final Thursday of November 1863. Like the First National Proclamation, Lincoln’s Thanksgiving Day was a time to thank God for continuing to bless the United States, even in the midst of civil war. If food doesn’t fill us with gratitude to the same degree it did the Pilgrims, perhaps we should follow the founding fathers in giving thanks for our country? Based on the awkward silence that ensued when my mother made this suggestion at our Thanksgiving meal this year, patriotism may be as hard for us to grasp as a true appreciation of food. It might be that many of us – especially those who were born in the United States -- take freedom for granted in much the same way we do food. It might also be that our national narrative has become so fractured that when we think of our country, it’s hard to get a handle on what the United States even is anymore. There is a tension inherent in the very nature of this national experiment: A country made up of waves of immigrants, drawn here by the ideal of individual freedom, who began by pushing out the indigenous peoples and trafficking in slaves from elsewhere. How do you form a coherent community out of that? Ideological beauty coexisting with an often-brutal reality: That we’ve succeeded thus far seems miraculous. So there was a time when our country realized that humility and thankfulness are two sides of the same coin: Saying “Thanks!” is an acknowledgement that we’ve been recipients of something – food, freedom, forgiveness – that we didn’t obtain through our own efforts alone. The Pilgrims confessed that they survived thanks to God and the Native Americans; our founding fathers admitted that our country sometimes screwed up and needed to apologize. I can get behind a Thanksgiving celebration of the gratitude that springs from receiving help and forgiveness. Can my country?